Almost 25 years after the premiere of his Obie Award-winning play Blade to the Heat, Associate Professor and playwright Oliver Mayer returned with the sequel, Members Only, which opened at the Los Angeles Theatre Center in October. 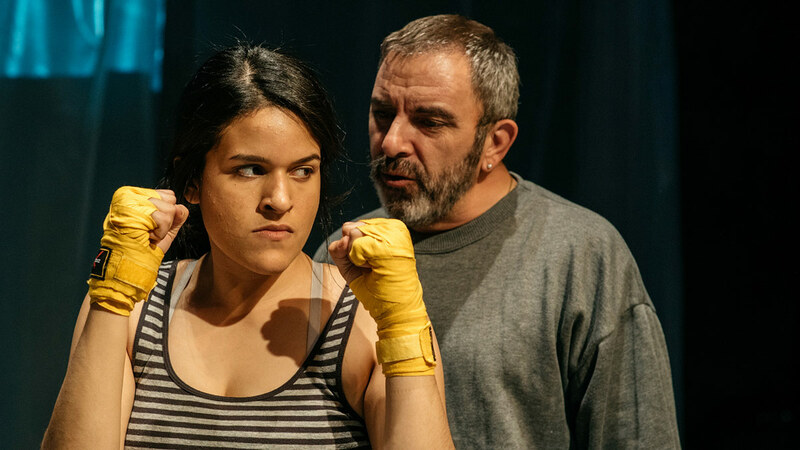 The production starred alumna Gabriela Ortega BFA ’17 as the boxer Lone. Read a Los Angeles Times interview. Watch an artist spotlight on YouTube. Members Only follows Pedro Quinn, a championship boxer as he comes to terms with his past in the ring and must also face the ongoing unnamed AIDS crisis. The play was presented by the Latino Theater Company. Mayer is the associate dean of strategic initiatives and of faculty at the USC School of Dramatic Arts. He has authored more than 30 plays. Past works include Blood Match, Yerma in the Desert, Fortune is a Woman and The Wallowa Project, among others. He also wrote the children’s book series Big Dog on Campus. An alumna of the undergraduate acting program at SDA, Ortega recently performed at the Hollywood Fringe Festival in a self-written solo show, Las García, and in the ensemble of Don’t Talk About It, SP!T About It. Her short film, Un Acto de Rebeldía al Día (A Rebellious Act a Day) — which she produced, wrote and starred in — screened at CommUNITY Day and the 2018 Institute for Theatre & Social Change Conference on campus, and screened at the Global Fund for Democracy and Development in November.